You couldn't write this any better if it were a B-movie MMA flick. UFC interim lightweight champion Tony Ferguson pulled out of the title fight with Khabib due to a freak accident and featherweight champion MAx Holloway was deemed ineligible to compete during the weigh-ins so #11-ranked Al Iaquinta got the call. All of this and Conor McGregor happened. The "Notorious" one and his gang attacked a bus carrying Khabib and other fighters injuring Michael Chiesa and Ray Borg in the process. This was an alleged retaliation on Khabib who bullied McGregor's best friend, Artem Lobov the other day. Chiesa, Borg, and Lobov were all taken off the card. All of this just 48 hours before the fights. Khabib was unhurt and will undoubtedly have added motivation heading to his bout with Iaquinta. He is the second-largest favourite on the card at -630 but the short-notice aspect isn't just a disadvantage to the New Yorker but also to him. Either way, this should be another vintage Khabib performance. Khabib is arguably the most dominant fighter in the UFC right now. Khabib has run through all nine of his UFC opponents and was barely scratched. His wrestling is on another level and even if Iaquinta trains with prominent wrestlers, he hasn't fought a wrestler quite like Khabib. He was also training for a fight against Paul Felder, a striker, not a grappler. Not to sell Iaquinta (+420) short: he has excellent boxing and is quite the athlete. His takedown defence is solid and he keeps improving. He also holds the striking edge should he keep the fight standing. But Khabib has fought potent strikers like Edson Barboza and Michael Johnson and waded through their shots before taking them down and beating them to a pulp. Iaquinta should be commended for taking this fight at the last second and saving the card despite openly expressing how much he fears Khabib. He will need to do as much damage as he can within the first few rounds when the fight starts on its feet. Khabib will stick to him like controversy sticks to McGregor and it'll be "Khabib Time" until it ends. 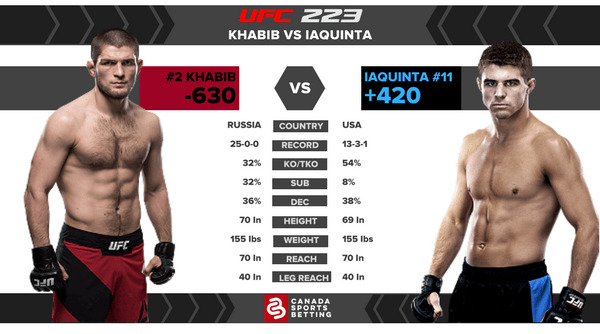 Prediction: unless Iaquinta can somehow knock Khabib out early, it'll be a long brutal night for him. Khabib will dominate with his wrestling then proceed to call out McGregor in a feud that has become personal. Lock it Up! For Zabit Magomedsharipov (-600); it's hard to find value at that price but he was the card's biggest favourite for a reason. The Russian is a martial arts phenom who is versed in almost every aspect of MMA; against Kyle Bochniak (+490), he fights a much slower fighter giving him every opportunity to shine. Who's A Good Dog? money has come in on UFC strawweight champion Rose Namajunas (-110) who opened at +145; she destroyed Joanna Jedrzejzcyk (-115) in their first bout and while a first-round TKO is unlikely, she should prevail once more utilizing her superior speed, movement, and strength. Just Say No: to Bec Rawlings (+168) versus Ashlee Evans-Smith (-195); while Evans-Smith should win this fight easily, she has a tendency to become inactive and make critical mistakes. And with Rawlings being tough and hard to finish, it could go to the incompetent judges. Hard pass. Despite all of the fight cancellations and main event changes, this card is still worth watching and still features top Canadian prospect Aubin-Mercier in a tough match-up against longtime vet Evan Dunham. Canadians will be among millions tuning in and betting on these online sportsbooks. Read the reviews and find the book that works for you.